Long time color fanatic here, and I know I am not alone. Maybe we should start a color loving club? Do they have those? I could probably be president. 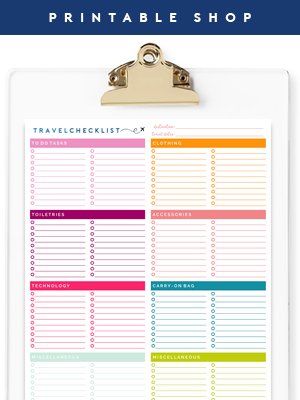 Pair color with organizing and my heart really goes wild. That is one of the many reasons I fell in love with Aniko's blog, Place Of My Taste. 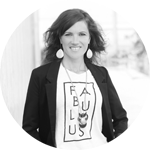 She shares that love of color and organization and always knows how to inject happiness into each project she tackles. That includes some recent bathroom updates she made, which she is sharing with us today. 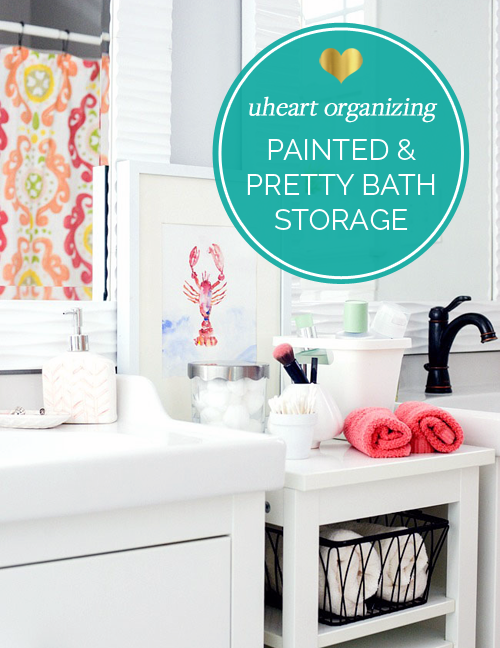 And not only do we have the privilege of oohing and aahing over her beautiful and bright bathroom, she is also gifting us with some beautiful, free artwork! Thank you Aniko! 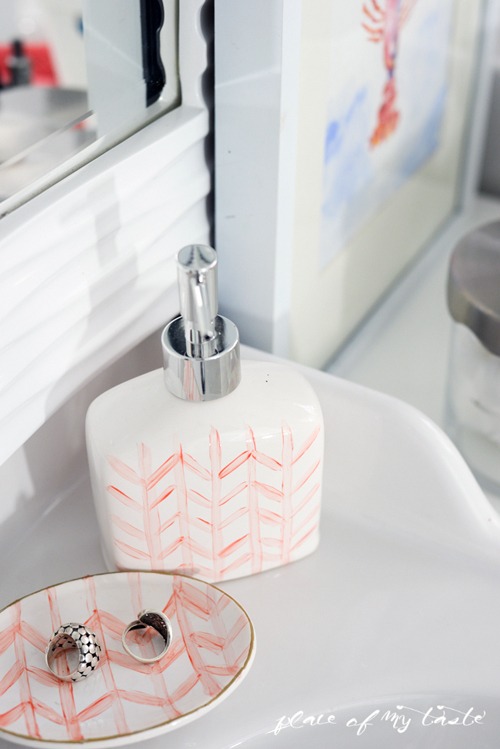 Today I am going to show you how I quickly refreshed our bathroom with a little pop of color. At the end of last year we tackled our bathroom makeover and I haven't really touched anything in there since then. 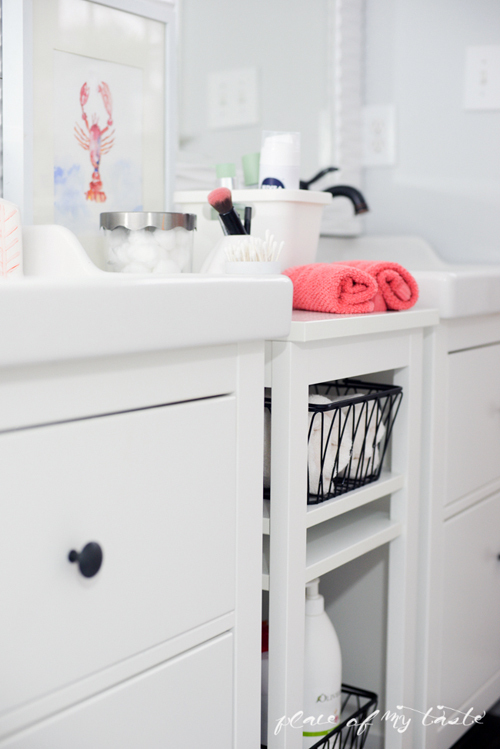 The bathroom wasn't completely finished (and it still isn't which seems to be the story of my life), however, we were so pleased with the how far we came with the it because it is now bright, cheery and definitely more spacious. You can see more of the bathroom remodel here, you may want to see the before picture, it is pretty dramatic. If you have been to my blog, you know that I am not afraid to use color. Not at all. I found a terrific coral shower curtain at Target, my favorite one stop shop, and it was the driving factor to use coral as an accent color throughout the entire bathroom. I recently spied a $1 ceramic soap dispenser and soap tray at Dollar Tree, and I immediately put them in my basket. I just knew that a little coral paint would make these the perfect addition to our space. 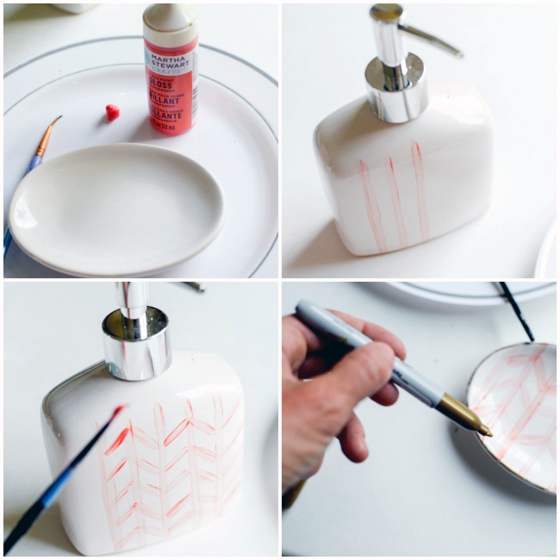 I am going to show you a quick tutorial of how you can make your own custom painted soap dispenser. Super easy and no, you don't have to be an artist to do this. As I said, you don't have to be an artist to do this. My lines were not perfect at all, but in my opinion, they don't really have to be. I just went on with my paint brush and painted my simple design. For the tray, I used the golden sharpie to highlight the edges. I re-purposed the soap tray for my rings. I like to take them off before I shower and this pretty tray makes perfect holding spot. The design is so imperfect and that is what I love most about it. It gives these ceramic pieces a super custom look. 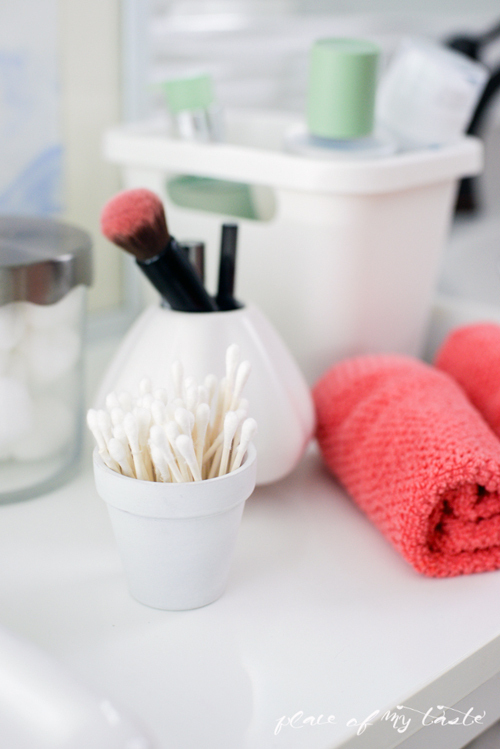 I wanted to go further and show you how I keep my bathroom organized and pretty at the same time. 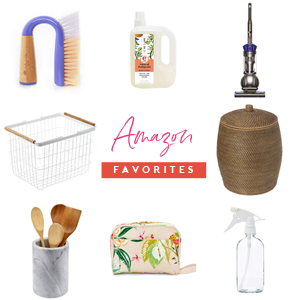 I use baskets, small vases and plastic bins to hold things that we use on a daily basis. 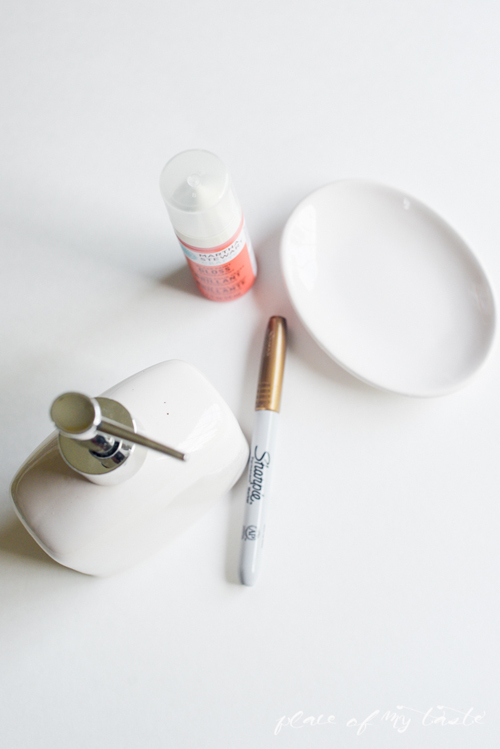 I love to have everything handy in the morning because I don't have much time to get ready and look for things at the same time. 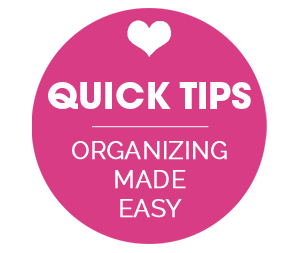 I keep my quick make-up items handy, as well as my facial products, cotton balls, shaving products for hubby, and few wash cloths. 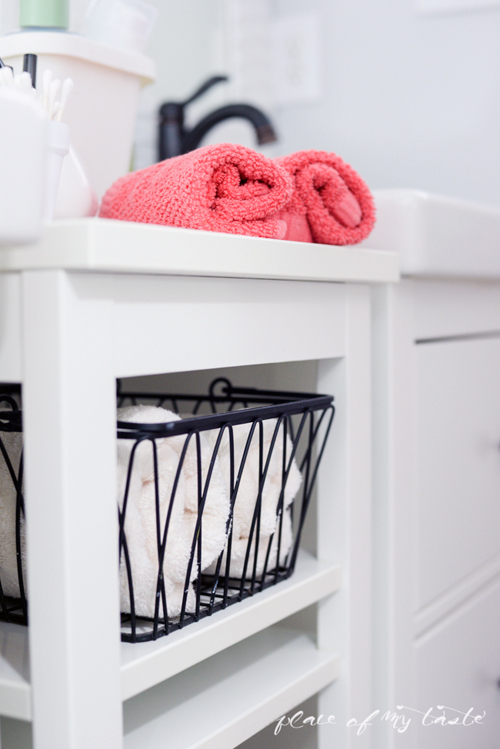 I have a shelf unit that I placed between my two vanities and it has baskets that hold extra hand towels, bathing and hair products. It fit perfectly and they keep everything easily accessible. 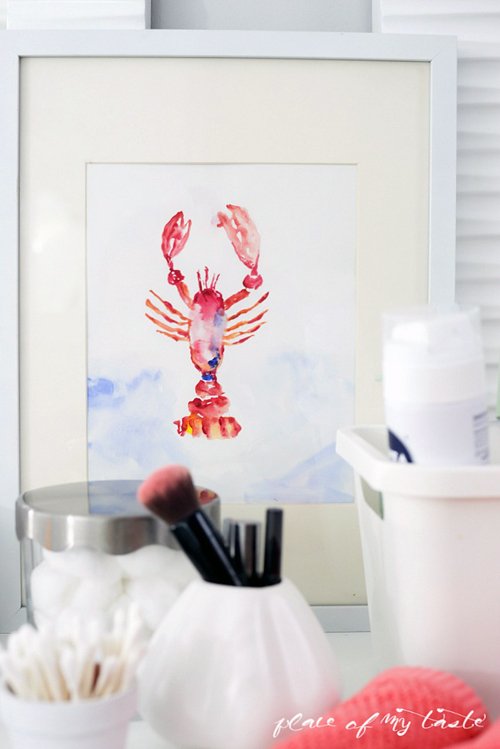 To make this bathroom feel a little more summery and beachy, I painted a piece of lobster artwork that I display right in front of my mirror. I am offering this watercolor art for FREE if you like it. I have been feeling a little artsy lately (if you follow me on Instagram you can see sneak peeks of my creations) and I have to admit, I absolutely love creating new designs. I am lucky to have talent in my hands from my dad, who also paints wonderful artwork. Thank you for reading today. I hope you are inspired to run to dollar store and grab a few ceramic pieces that you can custom paint. I will be back here in a couple of months, but until then I would love for you to visit me over at Place Of My Taste where I share lots of fun, colorful projects and yummy recipes, or go check out my shop and my creations over at Society 6. Cheers for a long and sunny weekend! "Hey there. 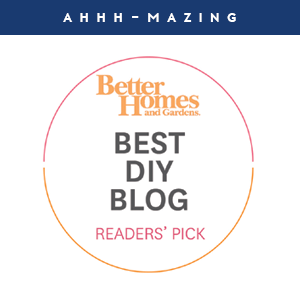 My name is Aniko and I blog over at Place Of My Taste. I am a wife, mother, business owner by day, DIY-er by night, design, decor and photography lover by heart who loves to cook, taste wine, dance for therapy and create all things beautiful. I share all this love over at my blog - at my happy place. Come see me there. xo"
I love that stand in between the vanities. What a cute way to add some storage! What a beautiful space. A little bit of color definitely adds a lot of cheer! I'm always amazed at how the simplest little things can make something plain look classy. I love color as well! Thanks for the fun free download perfect for summer months! I especially love the easy, cheap ideas!! 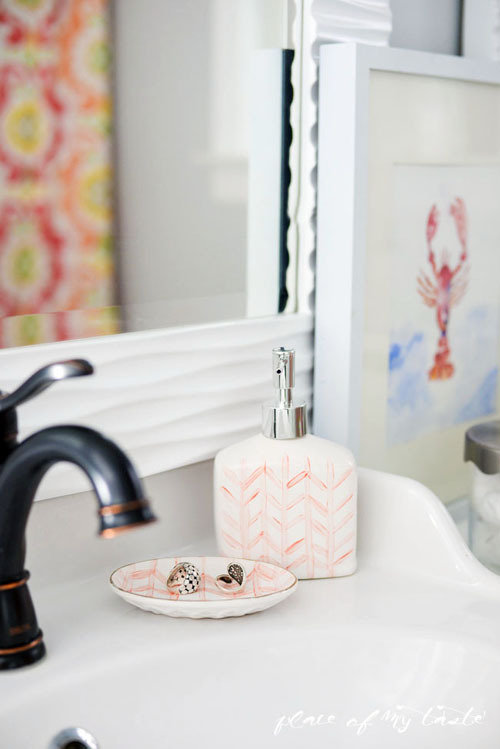 Love the coral accents, and that DIY soap dish looks totally do-able! Thanks for sharing! I'm Lovin' the coral. Very cute and quick idea for adding color. Thanks for sharing Aniko! 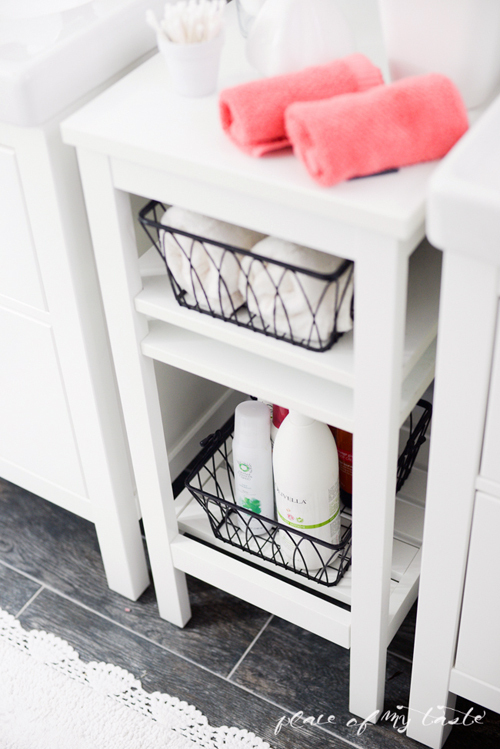 I love the black baskets on the white shelving. Such a clean look. 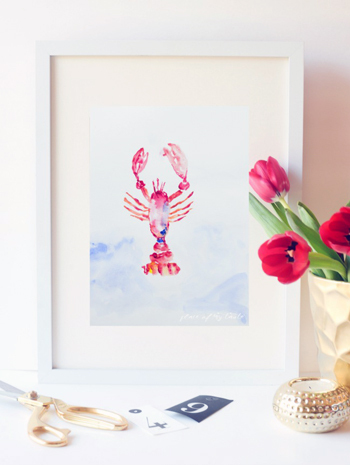 And the lobster painting is perfect for summer. New follower on Instagram here! This all turned out so great! 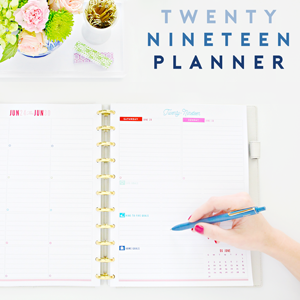 What simple touches that don't break the budget and can make a total transformation. 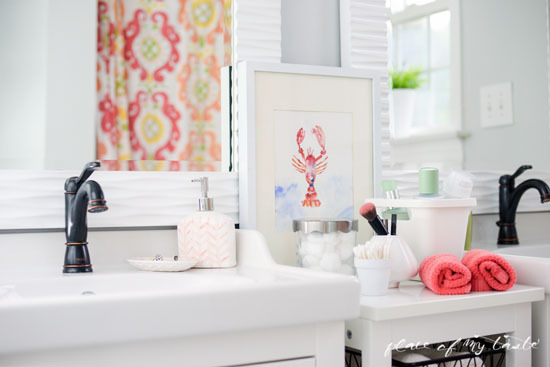 What a gorgeous space and I love the idea of personalising the soap dish and dispenser. I want to give that a go! Love the print! And clean simple bathrooms are always inspiring! Love it! May I ask where you got your shower curtain - love the colors! Love this! 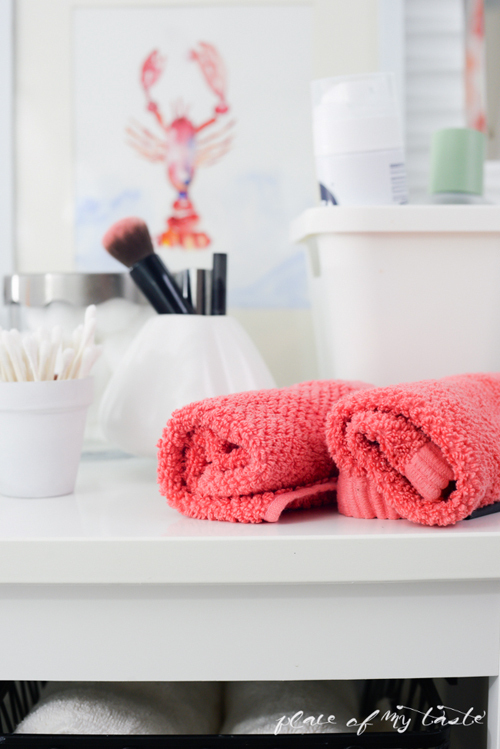 I am totally obsessed with those colorful towels. Definitely need them in my bathroom, haha. Where are the wire baskets from? So pretty!